Krabbe (2003, in F.H. van Eemeren, J.A. Blair, C.A. Willard and A.F. Snoeck Henkemans (eds. ), Proceedings of the Fifth Conference of the International Society for the Study of Argumentation, Sic Sat, Amsterdam, pp. 641–644) defined a metadialogue as a dialogue about one or more dialogues, and a ground-level dialogue as a dialogue that is not a metadialogue. Similarly, I define a meta-argument as an argument about one or more arguments, and a ground-level argument as one which is not a meta-argument. Krabbe (1995, in F.H van Eemeren, R. Grootendorst, J.A. Blair, C.A. Willard and A.F. Snoeck Henkemans (eds. ), Proceedings of the Third ISSA Conference on Argumentation, Sic Sat, Amsterdam, pp. 333–344) showed that formal-fallacy criticism (and more generally, fallacy criticism) consists of metadialogues, and that such metadialogues can be profiled in ways that lead to their proper termination or resolution. I reconstruct Krabbe’s metadialogical account into monolectical, meta-argumentative terminology by describing three-types of meta-arguments corresponding to the three ways of proving formal invalidity he studied: the trivial logic-indifferent method; the method of counterexample situation; and the method of formal paraphrase. A fourth type of meta-argument corresponds to what Oliver (1967, Mind 76, 463–478), Govier (1985, Informal Logic 7, 27–33), and Copi (1986) call refutation by logical analogy. 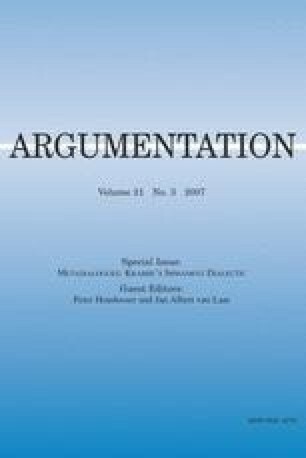 A fifth type of meta-argument represents my reconstruction of arguments by parity of reasoning studied by Woods and Hudak (1989, Informal Logic 11, 125–139). Other particular meta-arguments deserving future study are Hume’s critique of the argument from design in the Dialogues Concerning Natural Religion, and Mill’s initial argument in The Subjection of Women about the importance of established custom and general feeling vis-à-vis argumentation.